Pictured rehearsing their 'killer' moves for the Zombie & Vampire Silent Disco coming to Baboró International Arts Festival for Children were L-R: Susan Morton (10), Joseph Kelly (8), Aoife Waldron (8), Aaron Sweeney (8), Sophie Heneghan (8), Ben Donnelly (8) and Iona Ashton (10). Baboró runs from October 14-20. Photo: Boyd Challenger. The countdown has begun for excited young audiences as final preparations are underway before Baboró International Arts Festival for Children opens its doors to thousands of schoolchildren and families next Monday October 14 running until Sunday October 20. The 2013 programme features some excellent Irish shows alongside work from Ireland, Scotland, France, Italy, Germany, The Netherlands and the USA. There is a wide variety of shows suitable for all ages from 0 to 100 featuring theatre, puppetry, music and song, dance, art exhibitions, literature and arts and science workshops. Highlights include Collapsing Horse Theatre Company’s Human Child inspired by W.B. Yeat’s ‘The Stolen Child’ (Ages 8+ ), Galway’s Moonfish Theatre’s sinister and magical Tromluí Phinocchio (Ages 11+ ) and Catherine Wheels Theatre’s international hit show, Lifeboat tells the true story of two young girls who survived the sinking of the torpedoed ‘City of Benares’ ship in 1940 (Ages 10+ ). American singer songwriter and 3-time Grammy winner Tom Chapin will entertain and enlighten audiences with his feel-good music show (Ages 4+ and Family ) and don’t miss Theater Lejo’s Hands Up! a clever hand puppet show that will have all ages laughing-out-load (Ages 4+ ). 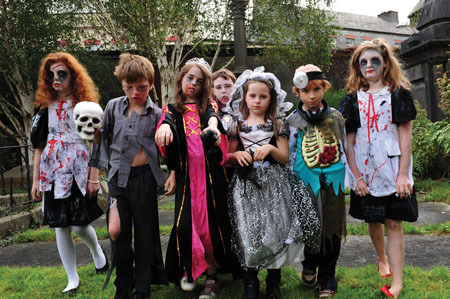 Festival favourites La Baracca–Testoni Ragazzi bring their hilarious and playful version of Red Riding Hood (Ages 4-7 ) and boogie on down at Róisín Beag’s Zombie and Vampire fancy dress Silent Disco (Ages 7-12 ). There is a bumper weekend of shows for families to enjoy together on Saturday 19th and Sunday 20th October. Must see shows includes the gorgeous C’est Dans La Poche (It’s In The Pocket ) a lovely introduction to theatre for the little ones (Ages 18 months + ), the enchanting Paperbelle where a world of black and white slowly transforms into a magical place of colour (Ages 2-5 ), Spot is a WALL-E like character a runaway hit show in London (Ages 1-4 ), Hands Up! a hilarious puppet show (Ags 4+ ) , Tom Chapin (Ages 4+ and Family ), Róisín Beag Silent Disco (Ages 7-12 ) and free events Pictiúr illustration visual art exhibition and The Exploratorium drop-in activity centre for children. The Exploratorium is a specially created temporary Festival Activity Centre featuring arts, technology and science. The drop-in activity centre is available to families and schools and artist Róisín Coyle will setup a unique space where children can explore their own creativity. There will be a range of free activities from making creations with cardboard or recycled materials to computer programming original music without an instrument in sight. Pictiúr is presented in partnership with Children’s Books Ireland and Galway Arts Centre. For the very first time in Ireland this unique exhibition will open at Galway Arts Centre comprising 42 art pieces by 21 leading Irish children’s books illustrators written in English and Irish. It is curated by Laureate na nÓg, Niamh Sharkey and features her work alongside that of PJ Lynch, Marie-Louise Fitzpatrick, Oliver Jeffers, Oisín McGann and many others. Families and school groups can read books, look at the pictures and respond to the artwork during visits. School groups can also request a free guided tour and workshop. Oisín McGann, author and illustrator of the Forbidden Files and the Mad Grandad series, will read at Charlie Byrne’s Bookshop on Saturday 19th October and will also read at the Pictiúr exhibtion later that afternoon. The introduction of the Festival’s new Relaxed Programme features performances specifically for parents or teachers who may have concerns about bringing children to a public event. The programme aims to provide a comfortable and relaxed space for children to enjoy the show, and in turn provide a stress-free environment for parents and teachers. There will be three Relaxed Programme shows, Spot, Paperbelle and Hands Up! Scotland will feature in this year’s Spotlight On…. Series. Eight years ago Baboró began this series with a discussion on work being created for young audiences in Scotland. Spotlight On…. Scotland will discuss the explosion of Scottish productions for babies, children and youth that are in high demand all over the world. Special guests will feature Tony Reekie, CEO of Imaginate, Scotland and Rhona Matheson, Director of Starcatchers, Scotland. Three shows from Scotland feature at Baboró 2013, Paperbelle, Cloud Man and Lifeboat. The Talking About…. Series will focus on the subject of ‘Sharing’ this year, and poses the question, “Does it pay to share?” There are many ways to share resources, time and talent and this event is an opportunity to hear the ups and downs of opening the doors to sharing. Participants include Gill Robertson, Artistic Director of Catherine Wheels Theatre in Scotland, Marc MacLochlainn, Artistic Director of Branar Theatre, Ireland and Teenagh Cunningham, General Manager of Baboró.